You are here: Home › X The Reading List › Brilliant Biz Books – Volume 2 Releasing Today! Small Business Owners & Entrepreneurs this book is designed to help you win BIG in the 21st century! It focuses on Fresh Perspectives on Profitability, People, Productivity, and Finding Peace in Your Business. Take advantage of our Launch Special on Wed, Nov 14, 2018 for a digital copy for ONLY 99 cents! Want to hold the book in your hands? Paperback books are available too! 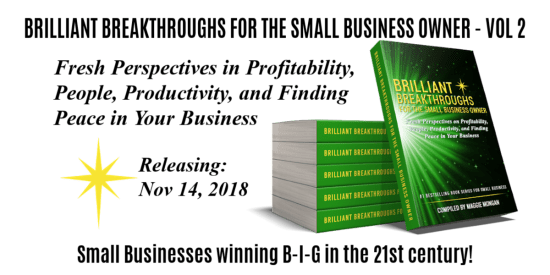 The Brilliant Biz Books Series authoring team is led by my friend, client, and mentor, and fellow Wisconsin Business Owners Organizer Maggie Mongan, President of Brilliant Breakthroughs, Inc.